Most officers who die in the line of duty are killed in traffic-related accidents. And one Hernando County deputy had a close call just a few days ago because a motorist didn't obey the law. HERNANDO COUNTY, Fla. — Most officers who die in the line of duty are killed in traffic-related accidents. And one Hernando County deputy had a close call just a few days ago because a motorist didn't obey the law. "So we got one right there, that green Mustang," said Deputy Brett Croft as a Mustang whizzed by a deputy who was pulled over with their lights on, on the side of the road. According to Florida law, that green Mustang should’ve gotten over or slowed way down when passing law enforcement. "The speed limit is 60 out here and he was still doing 58," said Croft. 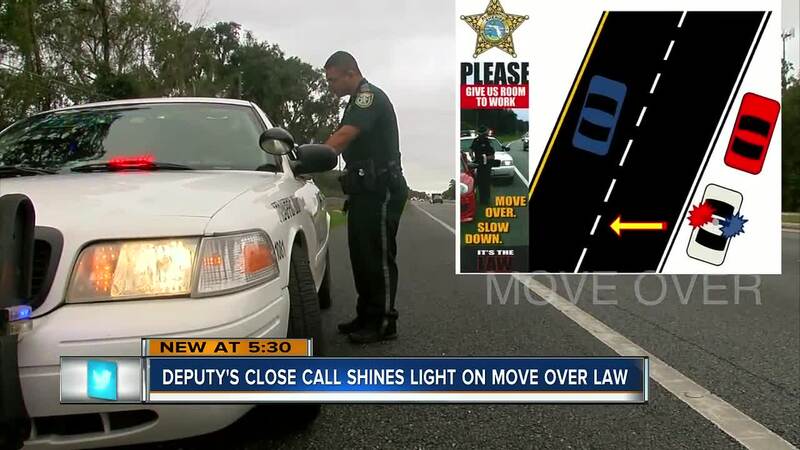 The "Move Over" law (Florida statute 316.126) says when you approach emergency, sanitation, or utility vehicles on the side of the road you must move over one lane of traffic if there are two or more lanes going the same direction. If you can't move over you must slow down to 20 miles per hour below the posted speed limit. Just a few days ago, a motorist didn’t move over and crashed into a Hernando County K-9 deputy who was pulled over to help a stranded motorist. "Our lives are on the line. We care about everyone’s lives and they should do the same for us by moving over and obeying the law that’s set in place," said Croft. The ticket for not pulling over is $164 and three points on your license.